Free 7 Day Mattress Exchange. Speak to an adjustable bed expert for help and advice. *In order to ensure the availability of a specialist sales advisor, it would be preferable to telephone to make a personal appointment to visit the showroom. Click here to compare this bed with other selected beds. ...with the peace of mind that if it does not work for you, you can send it back free of charge for a full refund. This does exclude special order beds and the turning bed however you will still have a free 7 night mattress exchange on all beds, beat that! Free Delivery & Installation in the UK mainland. Laybrooks standard delivery and set up service to UK mainland is 10-14 days from order and is free of charge. Our super-duper swift delivery and setup anywhere on mainland UK is within 3 - 5 working days of receipt of your order and costs only £145.00. Scottish Highlands* and Cornwall may take an extra few days. Fast deliveries to Scotland 10 days and will cost £145.00. *Delivery charges may apply to some Scotland deliveries - please contact our sales team on 0808 2740773 for further information. Includes motors, mechanisms and base. You can be rest assured that you have bought the best, we give a 5yr guarantee on this bed, including the mechanism, surround and even the motors, beat that! Choose Bed Type to proceed. 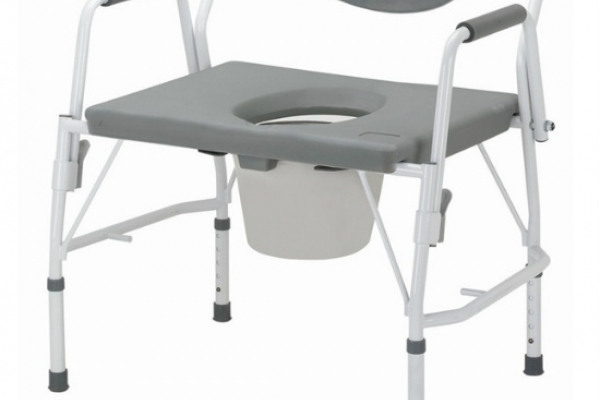 The Trent Commode is Bariatric, so built extra wide and allowing persons up to the weight of 46 stone (300kg) to sit on it. It is constructed of a durable, sturdy series of white powder coated steel tubing, as well as padded armrests and a 'snap on' seat. For easy transfer in and out of the seat, the arms have an easy to release mechanism which drops them down to the side, allowing much more room to manoeuvre in and out. This commode also has an easy to remove bowl, which is at the added size of 10 litres, so it won't have to be replaced so frequently.